This week, the second half of my favourite 12 images with a short description about why I like the shot, or composed it the way I have and hopefully I can share some of what goes through my mind when photographing. Switzerland, Italy, France - These are the three countries you are seeing in this shot. Standing near Grand Col Ferret in Switzerland looking South East after an enormous hike to this altitude. The bottom right corner is a tiny piece of Swiss mountain. 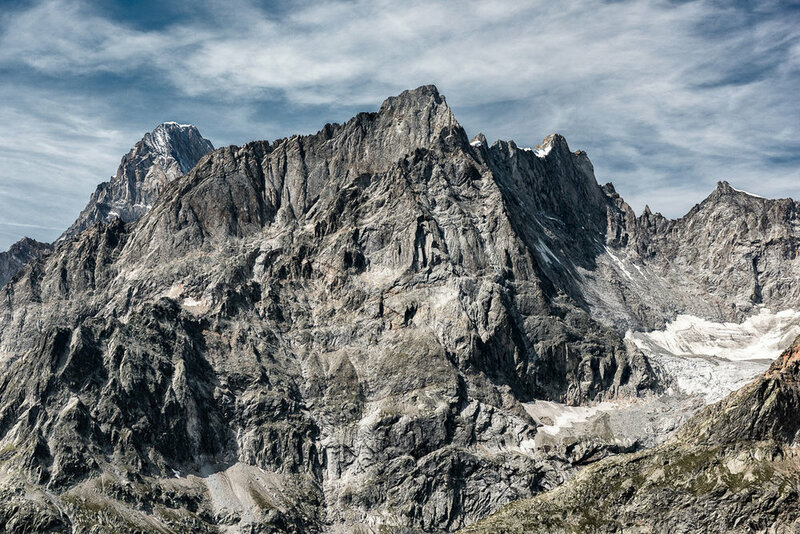 The central rockface is Aiguille de Leschaux and the snow filled bowl toward the right is Col de 'Éboulement both in Italy. The snowy(ish) peak in the background, standing at 4200m is Grandes Jorasses, France. I tried to show the grandness of these mountains. It's hard to show scale without a reference tree or human figure but these weren't available to I had to make do. The snow that fell a couple of nights before had mostly gone, this would have shown more defined textures and layering in the rock face, again, just unlucky. Post processing was done in Lightroom - A desaturation of colour, but not fully Black and White. 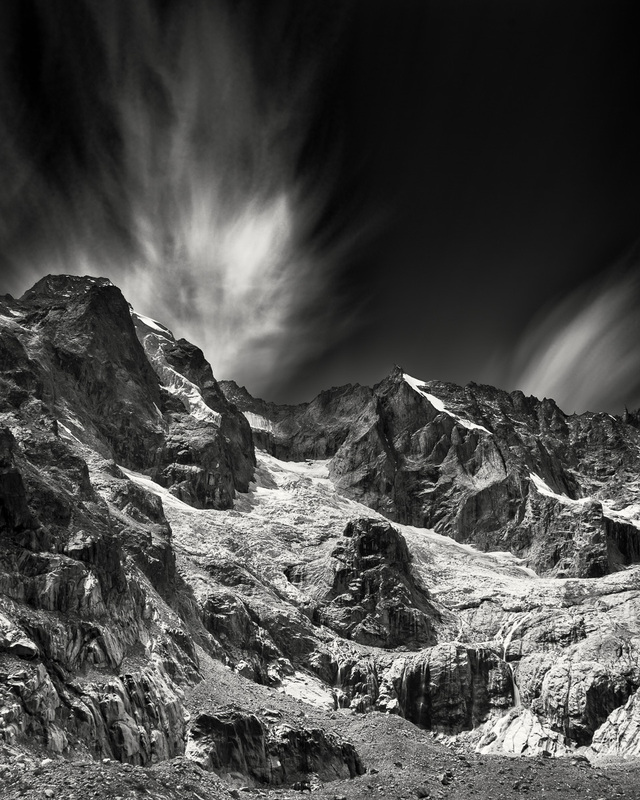 I am building a collection of mountain images in this style, some photos don't work in full B&W. A kite flying high above the city of Jaipur, India. Every January is the International Kite Festival where hundreds or thousnds of kites a flown over a few days. All throughout the year however, people are practising and just having fun. This day - a lone kite in the afternoon sun is seen high above the smog of the streets below. This is a little different for me, and the only shot I would categorise as 'Travel Photography' in my top 12 lineup. I like the minimal look of the empty sky, and the busy city below receding into the distance with the haze. Coniston Water in the Mist - VI, Lake District UK - Nikon D810 | Nikon 16-35mm f/4.0 @ f/11 35mm 10sec ISO 64 | Manfrotto tripod and ball head, no filters. It was raining hard and getting dark - I had just arrived here after several hours drive and wanted to stretch my legs, artistically and well, my actual legs. I love the way the mist has made all the distant distractions disappear or fade, making the whole scene minimal. It's peaceful and tranquil - I wanted to convey that message in the colour toning I had chosen, simply shooting intentionally at the wrong white balance. I started shooting this set with a tilt-shift lens, but rain was threatening to leak inside, so I switched to a weather sealed lens. In this image I wanted complete minimalism - no texture in the water, no sky detail (not that there was any) and just the shape of the pier cutting right through the picture. The foggy trees in the background add some interest and depth. This is part 6 of a 6-shot series. Mountainside, Switzerland - Nikon D810, Nikon 70-200 f/2.8 @ f/8 1/250sec ISO 64 95mm. Manfrotto carbon fibre tripod, and ball head. Quite late in the day, the clouds were rolling around, unpredictable. I had eyed up the composition during the previous days but I was never happy with the large blank sky which takes up half of the frame. I loved the pine trees below and the craggy rocks of which the afternoon sun lit its features. Finally some interesting clouds drifted in and I saw this; I love how the shape of the cloud mimics the shape of the mountain, and creates shadows over the pine woods. It's beautiful when you reach an alpine lake, high above the rest of the world after a few hours hike. I wanted to show more of the mountain range in this shot - I had a great sky and pockets of cloud also hanging about some of the tealler peaks across the range so a panorama was decided. I have processed this has a hard, contrasty B&W, such as my style, but also to try emphasise the hard backdrop with all its rocky textures. A fairly hard hike up to this glacier, here around 2500m altitude, up the glacial valley from La Fouly, Switzerland. I couldn't carry all my camera gear on this hike, so, only a lightweight tripod, one lens and no filters. When I reached this spot, I wanted to portray the slow movement of the glacial ice with a long exposure of the clouds but with no filters this was impossible with the bright day. I framed up the shot and set an intervalometer so the camera would take a shot every 5 seconds for about 10 minutes. I ended up with 103 individual images which I then blended, and the end result is nearly equivalent to a few minutes exposure. Check out my post last week for the first 6 of my favourites for 2017.